Woe to those who call evil good, and good evil, who change darkness into light, and light into darkness, who change bitter into sweet, and sweet into bitter! As a Catholic and Christian, it is difficult for me to digest the contempt that Obama has for the Catholic Church and all Christians. Why is it that Obama has decided to crush the Church? Catholics did not choose to start this fight; it was the government who started the altercation with Roe v Wade. I hate hearing that it is not a Republican or a Democrat problem because it is. It is a cultural WAR, it is a political WAR, it is a spiritual WAR. It is the Democrats who violate our rights and it is the Republicans who make an effort to restore our rights. It was Obama who first mentioned that America was not a Christian nation. It’s not like he just decided to take away the right of Americans to worship freely as we choose. He had a plan. During his bid for the presidency, he told all who cared to listen that he wanted to ‘transform’ America. It was not a secret. He began his task by elevating weak examples of so called Catholics. It was easy for Obama to select from the wide array of Democrat Catholics who place their party before God. First he chose as his running mate, Joe Biden, who delivered the Catholic vote in 2008 by 54% to John McCain’s 45%. There were other appointees who were Catholic Democrats and Obama knew where to place them. Unfortunately many Catholics and non Catholics fell for the empty promises Obama offered, and voted for him. Today they might feel betrayed but it is too late. Obama is in office and doing what he promised the American people he would do, ‘transform’ America. Congresswoman Nancy Pelosi another Catholic who feels compelled to interpret the Church’s standing on the Health and Human Services Mandate says she stands with Catholics. What she does not tell you is that she is standing with the Liberal Catholics. 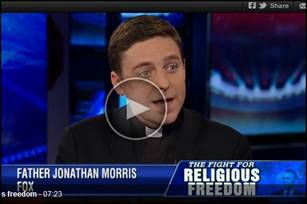 Catholics can not continue to believe the lies that come from the Obama Administration. We must act by informing our family and friends of the true nature of Obama’s intentions, as all evidence points to this, which is to take away our religious freedom. We can not be made to act against our conscience. Archbishop Timothy Broglio, Archbishop to the Military Services was asked to remove a sentence in his letter by Secretary of the Army John McHugh, ‘we can not – we will not – comply with this unjust law’ so that it would not be misinterpreted as ‘civil disobedience’. It was agreed that the sentence would be removed before reading to the families of the soldiers during mass. It is interesting that the Secretary of the Army McHugh, while cautiously trying to prevent ‘civil disobedience’, was blinded by the fact that the Commander in Chief saw fit to arbitrarily take our first Amendment, Freedom of Religion and Freedom of Speech, away from Americans fighting to protect our freedoms. Can any directive be more confusing than this? Republican Senator Roy Blunt has introduced Senate amendment 1520, Respect for Rights of Conscience Act, to the Transportation Authorization Bill (S. 1813). Please contact your senator and ask him to support this amendment. Senate Amendment 1520 to the Transportation Authorization Bill (S. 1813). Sen. Roy Blunt (R-MO) is the prime sponsor of both the Respect for Rights of Conscience Act and its amendment version. Support Senate Amendment 1520 to the Transportation Authorization Bill (S. 1813). THE BATTLE BEGINS AT HOME!